This Sunday is Palm Sunday, the beginning of Holy Week. At our church we'll be celebrating this special day by singing hymns and praise songs at the top of our lungs while children run around our church waving palm branches. Christians know how to party. The story that we essentially reenact every Palm Sunday is found in each of the Gospel accounts. This week we'll be studying Matthew's version, which is found in Matthew 21:1-11. Before we open up the text and start reading this story--a story that is often called "The Triumphal Entry" of Jesus into Jerusalem--I need to tell you about a "triumphal procession" that took place before this one. It was initiated by none other than Pontius Pilate himself--the Roman governor of the region. At each of the major feast days in Jerusalem, Pilate would process with his soldiers from his headquarters at Caesarea Maritima on the coast, across the Judean wilderness and into Jerusalem. Pilate's stated purpose was to keep the peace but there was more to it than peacekeeping. Pilate wanted the Jewish people to see the pomp, power, ceremony, shock and awe of Rome--to remind them of their place. He rode into Jerusalem on a warhorse, clothed in armor with his cloak fluttering behind him like a cape. Then there was a second procession--one that was much different as we shall soon see... Jesus processed into Jerusalem not on a warhorse, but a donkey. There were no soldiers in his retinue, just a bunch of fisherman and common people from Galilee. It's a sharp contrast--one that caused a stir, as a matter of fact. There was cheering, revolutionary symbolism and lots of hopeful words being sung and shouted. The people who were present thought they knew who Jesus was, they had ideas about what he was all about, and what he had come to accomplish. And then not even a week later, many of the people who witnessed Jesus' procession were screaming for him to be crucified. As we study this text today, I want us to hold on to this one thought that will guide us along the way: Knowing about Jesus isn't the same as opening your heart to him. 4 This took place to fulfill what was spoken through the prophet:5 “Say to Daughter Zion, ‘See, your king comes to you,gentle and riding on a donkey, and on a colt, the foal of a donkey.’”6 The disciples went and did as Jesus had instructed them. 7 They brought the donkey and the colt and placed their cloaks on them for Jesus to sit on. This was the symbol of a conquering king coming in peace--not intent on destruction and violent revolution, but in winning hearts and minds. This is the symbol of a servant-leader. The people that are coming with Jesus--the "crowd"--are the common people, followers of Jesus from Galilee. There are the Twelve, of course, but then there are other disciples and a wider group of people--some of whom may have eaten at the miraculous feeding of the multitude, or had experienced healing. The "crowd" is contrasted with the "city" which is made up of people who are not familiar with Jesus. This tidbit of information would have been very symbolic to the early Christians who lived in the region after the fall of Jerusalem and the destruction of the Temple by the Romans. The word for "stirred" is seis or "tremble" which is where we get the word "seismic" and it infers exactly what you would expect. This was an earth shaking moment. The people in the city are struggling to make sense of everything. People are shouting, singing and proclaiming the Hallel, a series of songs and prayers drawn from Psalms 113-118 which were sung at Passover. The choice of language, "Hosanna!" "Blessed is he who comes in the name of the Lord!" "the Son of David!" these all indicated that the crowd believed Jesus was the Messiah that had been longed for--the one who would deliver them from oppression. And then there was the symbolism of cloaks being thrown on the ground and palms being waved. The laying down of cloaks was a blast from Israel's past when the wicked king Ahab's soldiers laid their cloaks down in front of the conquering would-be king Jehu's chariot when he rode into the capital city of the Northern kingdom. And then there are the palms... Palms were nationalistic symbols for the Jews, like the waving of the Stars and Stripes is for us Americans. They reminded them of the great revolutionary hero Judas Maccabeus who freed his people from oppression from a wicked Syrian/Greek king. So there are these two groups... the "crowd" and the "city." As I pondered these two groups I had to wonder... which group ended up gathered in front Pontius Pilate as Jesus stood there beaten and bloodied... which group shouted over and over again, "Crucify him!"? Which group ultimately closed their hearts to him--wishing he were someone else? Was it the "city?" They seem a likely choice. But could it have been... both? 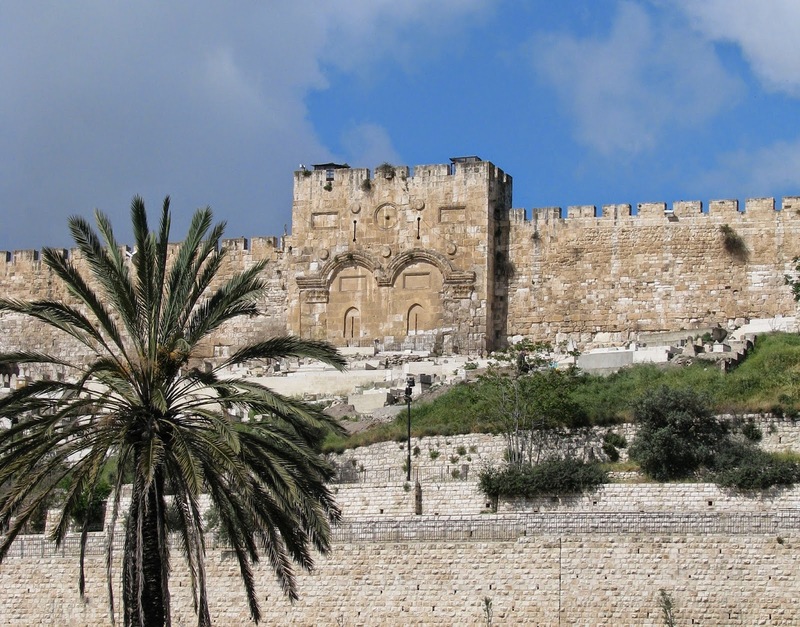 The photo at the top of this blog post is of the Eastern Gate of Jerusalem, the site of the one that Jesus went through on that incredible day. The gate in the photo was erected by Justinian, a Latin ruler of Jerusalem during the several centuries when Europeans held the Holy Land, but the original stood where it stands today. This gate was known by the Jews as "The Golden Gate" or "Gate Beautiful" due to it's ornate design, and prophetic import. They believed it was where the Shekinah, the glory of God, would appear, and of course they believed that the Messiah would one day come through it to liberate God's chosen. Early Christians believed that when Jesus returned in glory, he would once again pass through the Eastern Gate, and on that day, in the words of the Apostle Paul, "every knee shall bow and every tongue will confess that Jesus Christ is Lord." If we flash forward several centuries, we discover that this gate was also extremely important in the Muslim tradition. In Arabic it was called "The Gate of Eternal Life," and the Koran indicates that only the just will pass through this gate on the Day of Judgement. The great Sultan, Suleiman the Magnificent sealed Justinian's gate to demonstrate his power and the power of Islam over both Jewish and Christian tradition. A Muslim cemetary was built right in front of it in order to thwart Jewish prophecies about the Day of the Lord when Elijah the prophet would return as a herald to the Messiah and pass through the gate to the city. Since Jewish rabbis were forbidden to touch anything dead, it was believed Elijah would not fulfill prophecy as a result. All three of these religions have their own parade planned for that gate... for their Messiah. It's sealed shut until that time arrives. Then and only then will it be opened. And we are so much like the people who shouted, sang, danced and wondered on that incredible day when Jesus arrived in Jerusalem. We get so caught up in planning the parade for the Messiah we want--we never open the gate to the Messiah we need. Jesus disciples abandoned him in the end. The crowd dissipated. The city turned ugly. And all because he was not at all what they expected. And nothing like what they wanted. I happen to think there were members of both the "crowd" and the "city" shouting at Pilate to crucify Jesus. Their hearts were sealed shut against any Messiah except the one they desired. And they didn't open them to the One they needed. Years ago I met with a woman in the hospital who had been given the terrible news that the cancer invading her body was inoperable. She had weeks to live. As I talked to her, she revealed that she had gone to church "her whole life," and considered herself a Christian, but had lately been wondering if she had done something wrong, and God was punishing her. She then went on to tell me about her incredibly hard life--how she had been abandoned at an orphanage as a child, and then abandoned by her former husband, who was in the Navy when they were young and would leave her for months at a time. Her current husband and daughter had grown exhausted caring for her and had begun talking to her about moving her to an assisted living facility. It occurred to me that all of these stories connected to her feelings about God, and her expectations about what it meant to be a Christian. I asked her, "Do you feel like God has abandoned you?" Tears filled her eyes and she nodded. I told her that she and Jesus had something in common---that on the Cross he had felt the same way. I told her that God had always wanted her, always chosen her, and had always loved her more than she could ever know. "There is nothing you can do to separate yourself from the love of God," I told her. Jesus took care of that. Jesus, the Messiah--her Messiah. "Do you believe this?" I asked her gently. She told me that she did with tears streaming down her face. "Listen to me," I said to her. "God hasn't abandoned you. He is waiting for you with open arms and is more than ready to let you know--"Well done, good and faithful servant, enter into the joy of the Lord.'" This woman had spent her entire life knowing about Jesu, but had never really opened her heart to him---never really experienced the peace that comes from knowing that because of Jesus we don't ever have to be afraid again. Knowing about Jesus isn't the same as opening your heart to Him.